Collagen VI is widely distributed throughout extracellular matrices (ECMs) in various tissues. In skeletal muscle, collagen VI is particularly concentrated in and adjacent to basement membranes of myofibers. Ullrich congenital muscular dystrophy (UCMD) is caused by mutations in either COL6A1, COL6A2 or COL6A3 gene, thereby leading to collagen VI deficiency in the ECM. It is known to occur through either recessive or dominant genetic mechanism, the latter most typically by de novo mutations. UCMD is well defined by the clinicopathological hallmarks including distal hyperlaxity, proximal joint contractures, protruding calcanei, scoliosis and respiratory insufficiency. Recent reports have depicted the robust natural history of UCMD; that is, loss of ambulation by early teenage years, rapid decline in respiratory function by 10 years of age and early-onset, rapidly progressive scoliosis. Muscle pathology is characterised by prominent interstitial fibrosis disproportionate to the relative paucity of necrotic and regenerating fibres. To date, treatment for patients is supportive for symptoms such as joint contractures, respiratory failure and scoliosis. There have been clinical trials based on the theory of mitochondrion-mediated myofiber apoptosis or impaired autophagy. Furthermore, the fact that collagen VI producing cells in skeletal muscle are interstitial mesenchymal cells can support proof of concept for stem cell-based therapy. Collagen VI is an important component of the ECM of skeletal muscle and is involved in maintaining tissue integrity by providing a structural link between different ECM molecules and in promoting adhesion,1 ,2 proliferation,3 migration4 and survival5 of various cell types. Collagen VI-related myopathies are the hereditary myopathies caused by mutations in either COL6A1, COL6A2 or COL6A3 gene, each encoding a subunit of collagen VI. Patients have the clinicopathological features of a muscle disorder as well as of a connective tissue disorder, although the link between this defect of ECM and phenotype remains to be fully elucidated. Phenotypic stratification of early-onset collagen VI-related myopathies; modification from Quijano-Roy et al10 and Briñas et al11 (A). Typical distal hyperlaxity and protruding calcanei in a patient with Ullrich congenital muscular dystrophy (UCMD) (B,C). Diagnostic muscle MRI findings of the thigh (D): fatty regeneration along the fascia in the centre of the rectus femoris (arrow) and in the periphery of the vastus lateralis with relative sparing of its central part (arrowheads). Early-onset and rapidly progressive scoliosis in UCMD (E–H). E, 3.7; F, 6.1; G, 6.9; H, 7.9 years of age at assessment. (Images courtesy of Drs Ikuya Nonaka and Akihiko Ishiyama). The hallmarks of UCMD include marked distal joint hyperlaxity associated with proximal joint contractures, a rigid spine and normal intelligence. Furthermore, children presenting UCMD phenotype have been referred to as having ‘early severe’ or ‘moderately progressive’ course of early-onset collagen VI-related myopathies according to maximal motor ability and disease progression.10–12 Thus, UCMD is relatively well defined as compared with BM or intermediate phenotypes. Variable degrees of histological changes can be observed in muscle biopsies from patients with UCMD. The spectrum includes fibre size variation affecting both fast and slow fibres, type 1 fibre predominance, increased endomysial connective tissue or adipose tissue, increased number of internal nuclei and mild necrotic and regenerating process along with indirect evidence of regenerating fibres such as the presence of fibres containing fetal myosin.21 ,24 One report described that, early in the disease, UCMD presents as a non-dystrophic myopathy with predominant fibre atrophy, showing a bimodal size distribution of type 1 fibres or a diagnostic pattern of congenital fibre-type disproportion.25 Unlike other muscular dystrophies, interstitial fibrosis seems disproportionately prominent considering the relative paucity of necrotic and regenerating fibres in UCMD. Double immunostaining for collagen IV and VI. (A–C) Patient with non-diagnostic muscle pathology; (D–F) UCMD patient with CD; (G–I) UCMD patient with SSCD. (A,D,G) Immunostaining for collagen IV. Collagen IV is present in the sarcolemma. (B,E,H) Immunostaining for collagen VI. Collagen VI is absent in a patient with CD, while it is present in the interstitium but markedly reduced in a patient with SSCD. (C,F,I) Merged images. Both collagen IV and VI are present in the sarcolemma in a patient with non-diagnostic pathology, as indicated by yellow; in contrast, collagen VI is absent in the sarcolemma in a patient with SSCD, as indicated by only red. UCMD, Ullrich congenital muscular dystrophy; CD, complete collagen VI deficiency; SSCD, sarcolemma-specific collagen VI deficiency, bar 20 μm. Muscle weakness is slowly progressive. Most affected children become able to walk independently but eventually lose ambulation often by early teenage years. Loss of ambulation is reported to occur at 10.7±4.8, 10.1±4.4 and 8.8±2.9 years of age in English, French and Japanese group of patients with UCMD, respectively.11 ,19 ,20 However, this can be widely variable: some patients never walk while others can still walk even beyond late teens. After loss of ambulation, progression of muscle weakness becomes less prominent. In contrast, the contractures can still be progressive, particularly in the ankles, knees, hips and elbows, aggravating physical disability. These clinical features may well be in line with strikingly progressive interstitial fibrosis on muscle pathology. Respiratory insufficiency usually occurs after the loss of ambulation. It is noteworthy, however, some patients have impending respiratory dysfunction while they are still ambulant. Progressive decline in the predicted forced vital capacity (FVC) or vital capacity (VC) is observed from the preschool age to the early teens.19 ,20 Of note, restrictive respiratory dysfunction develops rapidly in the first decade of life; indeed, %predicted FVC declines by 6.6±1.9%/year from 6 to 10 years of age compared to by 0.4±3.0%/year from 11 to 15 years of age.20 Similarly, VC declines exponentially with a sharp decrease by 10 years of age.19 This may well be associated with proximal joint and vertebral contractures together with weakness of the diaphragm. The introduction of non-invasive ventilation (NIV) is usually sufficient to treat this situation effectively for many years. The percentage of patients with NIV increases with age; half require NIV by age 11–12 years.12 ,19 Natural history study from UK reported that age at initiation of NIV was 14.3±4.7 years, with a mean FVC of 20%.20 The other two studies have recently reported similar findings: an estimated predicted VC of 36% at the time of initiation of NIV at 11.2±3.6 years in a Japanese cohort19 and an average FVC of 34% just before NIV initiation at 11.3±4.0 years in a large international cohort,12 demonstrating a remarkable consistency of the pulmonary function declining in patients with UCMD among different cohorts, regardless of different approaches to data acquisition. Scoliosis, which may require surgical correction, is a common complication.15 ,20 Substantial scoliosis appears as early as preschool years and its onset precedes loss of ambulation.19 ,20 Development of scoliosis in Duchenne muscular dystrophy (DMD) is strongly related to the loss of walking ability—scoliosis is not typically evident in ambulatory patients and develops after they become wheelchair dependent. In contrast, in UCMD, scoliosis develops even when patients are still ambulant and is progressive from early stage. In our cohort, a maximum progression rate of Cobb angle was 16.2±10.0°/year.19 Importantly, scoliosis progresses rapidly within years, once it starts (figure 1E–H). The early-onset and rapidly progressive scoliosis in UCMD may well accelerate physical disability, such as difficulty sitting, standing and walking, and cause pain. More importantly, scoliosis can aggravate respiratory function by reducing the rib cage compliance in combination with other proximal joint contractures. Of particular importance is rigid spine with muscular dystrophy type 1 (RSMD1) in forms of CMD, which results from mutations in the SEPN1 gene, because it can show a significant clinical overlap in the late stage of the disease. RSMD1 patients typically show combination of mild or moderate proximal muscle weakness, Achilles tendon tightness, spinal rigidity and scoliosis, and require ventilator assistance in the first decade of life,15 similarly to UCMD. Treatment for patients with UCMD is supportive for symptoms such as respiratory insufficiency and scoliosis, and is dependent on age of the individual and severity of symptoms. Respiratory failure is a common complication of UCMD and careful follow-up with regular assessments of respiratory function, including spirometry and nocturnal oximetry studies, is important to detect asymptomatic decline in patients. In a recent review based on expert consensus on the standard care for CMD, cough assistance using mechanical insufflation-exsufflation is generally accepted as the method to improve cough efficiency.22 Other methods such as breath stacking with Ambu bag maintain thoracic compliance and reduce the risk of chronic atelectasis.22 Respiratory support with nocturnal NIV usually becomes necessary in the first or second decade of life for patients12 ,19 and might be effective in reducing symptoms and promoting quality of life. There are times when chronic ventilation can require an invasive application via tracheostomy. For scoliosis, conservative management including standing frame, positioning and bracing is widely used, although controversial whether those approaches are preventive.22 However, scoliosis may require active management including spinal surgery to prevent progression, although there have been no formal studies on the efficacy of scoliosis surgery. The choice of the instrumentation such as growing rods depends on the age of the individual, his/her ability to grow and the severity of scoliosis.22 Suggested contraindications to spinal surgery includes family decision, very poor or deteriorating cardiac status and/or respiratory status, very young age, potential loss of function after spinal fixation and severe scoliosis.22 Severe respiratory insufficiency may not be a contraindication in certain high specialised centres. In fact, one study on surgical correction of spinal deformity from Japan reported that scoliosis surgery was successfully performed in three patients with UCMD at 11, 13 and 17 years of age, respectively31; spinal surgery, however, did not prevent deterioration of respiratory function in these patients, suggesting that at such older ages pulmonary and chest wall compliance might be too severely compromised for patients to benefit from scoliosis surgery, and earlier surgical intervention may be more beneficial. Indeed, a single case report described that slower decline of predicted VC in a patient after scoliosis surgery performed at 5 years of age compared with another patient who had undergone surgical correction of scoliosis at 9 years of age.19 Further studies are necessary to conclude the efficacy of early scoliosis surgery. Equipment recommended for assistance in standing, ambulation and/or other forms includes walking frames, standing frames, swivel walker, knee-ankle-foot orthoses, ankle-foot orthoses, scooters and wheelchairs.22 The joint contractures of patients with UCMD in particular seem to be progressive and regular stretching is recommended to maintain a certain level of mobility of the joints. In addition, feeding and swallowing difficulties can be encountered in UCMD.20 Issues of feeding and nutrition are multifactorial and closely related to other areas of care; for example, nocturnal hypoventilation can affect appetite and growth and respiratory insufficiency can result in easy fatigue and difficulty in swallowing.22 Consultation with a nutrition specialist is often helpful to boost energy intake. Some children may need a temporary or permanent gastric feeding tube support to maintain an adequate nutritional and fluid intake.20 ,21 Survival has not been fully documented under the current standards of medical care, but failure to introduce adequate respiratory support might lead to the death of teenagers with UCMD.11 ,21 With the availability of effective respiratory interventions, patients commonly survive into adulthood to date, and other potential aspects of the disease could surface. The most common types of mutations are point mutations, exon skipping and mutations leading to premature termination codons (PTCs).32 Among point mutations, missense changes affecting glycine residues in the Gly-Xaa-Yaa motifs of the N-terminal triple helical domains are the most common and are often dominant de novo.32 ,33 Splice mutations resulting in in-frame exon skipping are generally dominant de novo mutations.32 ,33 These dominant mutations can result in secretion of some mutant-containing tetramers into the extracellular space; in the multistep collagen VI intracellular assembly process, only 1/16 of the tetramers produced by patients with dominant mutations could be composed entirely of normal α-chains, thus exerting a dominant negative effect.37 This leads to loss of normal localisation of collagen VI in the basement membrane and eventually results in a severe phenotype. Nonsense mutations and small deletions or insertions inducing PTCs with consequent nonsense-mediated mRNA decay (NMD), an mRNA quality control mechanism that degrades aberrant mRNAs containing PTCs, and loss of the mutated chain are mostly inherited as recessive mutations.32 ,33 Patients with these mutations are unable to assemble or secrete functional collagen VI protein, as all three α-chains are required to form a collagen VI monomer. Thus, such functional null alleles, which underlie typical UCMD, mostly lead to CD mode of collagen VI in skeletal muscles.16 ,26 ,33 ,34 On the other hand, complete deletions of one copy of these genes also act in a recessive fashion. In support of this notion, carriers of the deletion are in fact clinically asymptomatic, indicating that complete haploinsufficiency of any of the three collagen VI genes does not cause the disease. Interestingly, two reports demonstrated that autosomal-recessive inheritance can also underlie BM, in which patients carried a truncating or null COL6A2 mutation associated with missense changes in the partnering allele lying within the C2 domain of the α2 chain.38 ,39 Furthermore, myosclerosis syndrome was reported to be responsible for a homozygous nonsense COL6A2 mutation.40 Unlike nonsense mutations associated with UCMD, the mutated mRNA escaped NMD and was translated into a truncated α2 chain, but secreted collagen VI was reduced and structurally abnormal and thus did not correctly localise in the basement membrane of myofibers. These facts suggest that the severity of collagen VI gene mutations and the resulting functional abnormality of collagen VI in the ECM dictate a phenotypic spectrum of collagen VI-related myopathies, meaning that a fundamentally different genetic and biochemical mechanism among these myopathies can no longer be assumed. We previously showed that there are two modes of collagen VI deficiency, CD and SSCD,26 which respectively result from recessive and de novo dominant mutations in the collagen VI genes.16 There is no straightforward correlation between protein levels and phenotypes; CD, however, is most likely to be associated with the more severe phenotype than SSCD.11 ,19 Unlike patients with CD, a great heterogeneity in the maximal motor capacity was observed in patients with SSCD, ranging from no acquisition of walking ability to retaining ambulation throughout childhood. Studies on muscle fibres from Col6a1−/− mice, engineered by genetic ablation of the Col6a1 gene,50 and human myoblast cultures has suggested that collagen VI may be involved in preventing myofiber apoptosis, which seems to be mediated by regulating the mitochondrion-mediated cell death cascade5 ,51; a key event appears to be inappropriate opening of the mitochondrial permeability transition pore. These findings therefore link a defect of the ECM to mitochondrial dysfunction followed by apoptosis that is preventable by inactivation of cyclophilin D by using cyclosporine A, its derivative Debio025 or genetic inactivation of cyclophilin D.51–53 However, there are contradictory reports in which researchers did not find evidence of myofiber apoptosis in biopsied muscles from UCMD patients or Col6a3 mutant mice muscles,54 ,55 suggesting that muscle cell death by apoptosis is not a universal phenomenon in all patients and collagen VI-deficient mice. In addition, a study of the autophagic process in muscles of Col6a1−/− mice revealed that autophagy was not induced efficiently, which determines the presence of dysfunctional organelles in muscle fibres.56 A similar alteration of autophagy was also detected in muscle biopsies derived from nine patients with UCMD or BM.56 This defective autophagy provides the link between the previously described mitochondrial dysfunction and myofiber degeneration. These data thus provide a basis for novel therapeutic targets to reactivate of the autophagic flux by either nutritional approaches57 or by pharmacological and genetic tools in collagen VI deficient skeletal muscle. The events responsible for myofiber atrophy and loss might be different in UCMD than in other forms of muscular dystrophy with prominent membrane fragility such as DMD. To date, no single hypothesis can fully explain variation in fibre size, ongoing interstitial fibrogenesis and adipogenesis even in mild necrotic and regenerating process in UCMD or provide all targets for therapies, although important clues have been discovered. UCMD is caused by mutations in either COL6A1, COL6A2 or COL6A3 gene, thereby leading to collagen VI deficiency in the ECM. We here presented the clinicopathological features, robust natural history and the current supportive care for symptoms. Of special interest is progressive interstitial fibrosis even in very mild necrotic and regenerating process in muscle. Patients with UCMD have unique manifestations attributable to both muscle and connective tissue disorders. Collagen VI contributes to the properties of the local ECM microenvironment by forming a discrete network of beaded microfilaments, which interact with a large number of matrix molecules and cell surface receptors. Advanced researches have provide important clues to explain how collagen VI deficiency in the ECM can cause the development of muscle weakness in Col6a1−/− mice or patients with UCMD, although the link between the ECM defect and phenotype remains to be fully elucidated. Further studies are necessary to elucidate exactly how collagen VI deficiency in the ECM makes muscle cells vulnerable to apoptosis or interstitial fibrogenesis and adipogenesis strikingly progressive. The authors thank Drs Ikuya Nonaka, Hirofumi Komaki and Akihiko Ishiyama for their valuable assistance. This study was supported by Intramural Research Grant (23-5) for Neurological and Psychiatric Disorders of NCNP, Research on Rare and Intractable Diseases and Research on Applying Health Technology from the Ministry of Health, Labour and Welfare of Japan.
. Cell adhesion to type VI collagen. Biochem Soc Trans 1991;19:843–7.
. Reduced cell anchorage may cause sarcolemma-specific collagen VI deficiency in Ullrich disease. Neurology 2007;69:1043–9.
. Collagen VI regulates normal and transformed mesenchymal cell proliferation in vitro. Exp Cell Res 1996;228:283–91.
. Adipocyte-derived collagen VI affects early mammary tumor progression in vivo, demonstrating a critical interaction in the tumor/stroma maicroenvironment. J Clin Invest 2005;115:1163–76.
. Mitochondrial dysfunction and apoptosis in myopathic mice with collagen VI deficiency. Nat Genet 2003;35:367–71.
. Kongenitale, atonisch-skelerotische Muskeldystrophie, ein weiterer Typus der heredodegenerativen Erkrankungen des neuromuskulären Systems. Z Ges Neurol Psychiat 1930;126:171–201.
. Kongenitale, atonisch-skelerotische Muskeldystrophie. Monatsschr Kinderheilkd 1930;47:502–10.
. Benign myopathy, with autosomal dominant inheritance. A report on three pedigrees. Brain 1976;99:91–100.
. Position of glycine substitutions in the triple helix of COL6A1, COL6A2, and COL6A3 is correlated with severity and mode of inheritance in collagen VI myopathy. Hum Mutat 2013;34:1558–67.
. Predictive factors of severity and management of respiratory and orthopaedic complications in 16 Ullrich CMD patients [abstract]. Neuromuscul Disord 2007;17:844.
. Early onset collagen VI myopathies: Genetic and clinical correlations. Ann Neurol 2010;68:511–20.
. Natural history of pulmonary function in collagen VI-related myopathies. Brain 2013;136:3625–33.
. Collagen VI related muscle disorders. J Med Genet 2005;42:673–85.
. Bethlem myopathy (BETHLEM) and Ullrich scleroatonic muscular dystrophy: 100th ENMC International Workshop, 23–24 November 2001, Naarden, the Netherlands. Neuromuscul Disord 2002;12:984–93.
. The congenital muscular dystrophies in 2004: a century of exciting progress. Neuromuscul Disord 2004;14:635–49.
. Primary collagen VI deficiency is the second most common congenital muscular dystrophy in Japan. Neurology 2007;69:1035–42.
. Diagnosis and etiology of congenital muscular dystrophy. Neurology 2008;71:312–21.
. Prevalence of genetic muscle disease in Northern England: in depth analysis of a muscle clinic population. Brain 2009;132:3175–86.
. Rapidly progressive scoliosis and respiratory deterioration in Ullrich congenital muscular dystrophy. J Neurol Neurosurg Psychiatry 2013;84:982–9.
. Natural history of Ullrich congenital muscular dystrophy. Neurology 2009;73:25–31.
. Collagen VI involvement in Ullrich syndrome: a clinical, genetic, and immunohistochemical study. Neurology 2002;58:1354–9.
. Consensus statement on standard of care for congenital muscular dystrophies. J Child Neurol 2010;25:1559–81.
. Muscle MRI in Ullrich congenital muscular dystrophy and Bethlem myopathy. Neuromuscular Disord 2005;15:303–10.
. A clinical and histological study of Ullrich's disease (congenital atonic-sclerotic muscular dystrophy). Neuropediatrics 1981;12:197–208.
. Predominant fiber atrophy and fiber type disproportion in early Ullrich disease. Muscle Nerve 2008;38:1184–91.
. Ullrich disease due to deficiency of collagen VI in the sarcolemma. Neurology 2004;62:620–3.
. Ullrich disease: collagen VI deficiency: EM suggests a new basis for muscular weakness. Neurology 2002;59:920–3.
. Macrophages: a minimally invasive tool for monitoring collagen VI myopathies. Muscle Nerve 2011;44:80–4.
. Myopathy with lobulated fibers, cores, and rods caused by a mutation in collagen VI. Neurology 2012;79:2288–90.
. Neuromuscular involvement in various types of Ehlers-Danlos syndrome. Ann Neurol 2009;65:687–97.
. Surgical correction of spinal deformity in patients with congenital muscular dystrophy. J Orthop Sci 2010;15:493–501.
. ColVI myopathies: where do we stand, where do we go? Skelet Muscle 2011;1:30–42.
. The collagen VI-related myopathies: muscle meets its matrix. Nat Rev Neurol 2011;7:379–90.
. Ullrich congenital muscular dystrophy is caused by recessive mutations in collagen type VI. Proc Natl Acad Sci USA 2001;98:7516–21.
. Frameshift mutation in the collagen VI gene causes Ullrich's disease. Ann Neurol 2001;50:261–5.
. New molecular mechanism for Ullrich congenital muscular dystrophy: a heterozygous in-frame deletion in the COL6A1 gene causes a severe phenotype. Am J Hum Genet 2003;73:355–69.
. Dominant collagen VI mutations are a common cause of Ullrich congenital muscular dystrophy. Hum Mol Genet 2005;14:279–93.
. Autosomal recessive Bethlem myopathy. Neurology 2009;73:1883–91.
. Autosomal recessive inheritance of classic Bethlem myopathy. Neuromuscul Disord 2009;19:813–17.
. Autosomal recessive myosclerosis myopathy is a collagen VI disorder. Neurology 2008;71:1245–53.
. 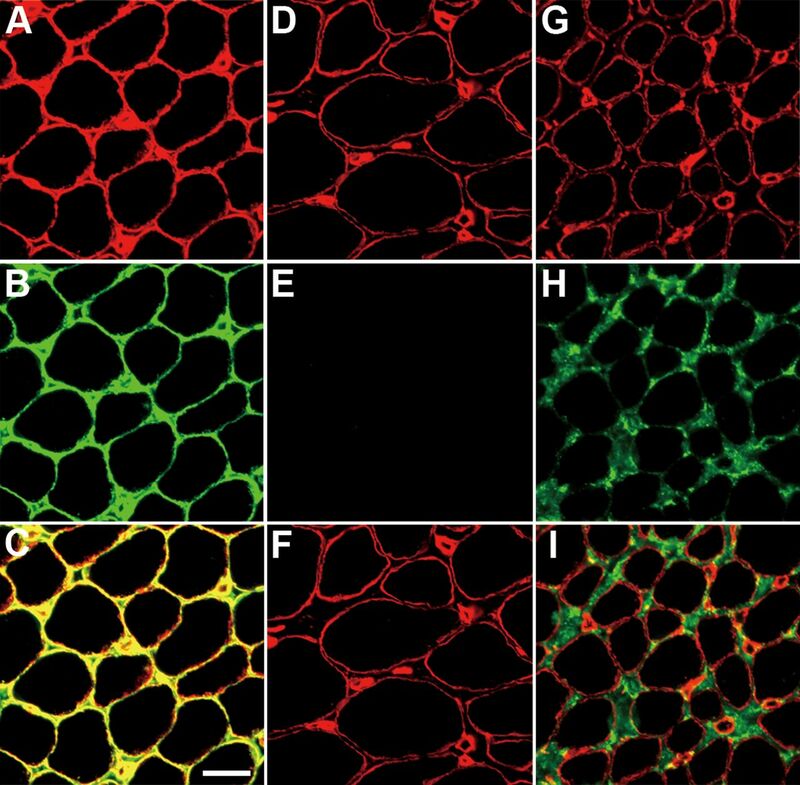 Muscle interstitial fibroblasts are the main source of collagen VI synthesis in skeletal muscle: implications for congenital muscular dystrophy dystrophy types Ullrich and Bethlem. J Neuropathol Exp Neurol 2008;67:144–54.
. An enhancer required for transcription of the Col6a1 gene in muscle connective tissue is induced by signals released from muscle cells. Exp Cell Res 2008;314:3508–18.
. Tendon cell array isolation reveals a previously unknown fibrillin-2-containing macromolecular assembly. Structure 2003;11:1179–88.
. Soluble collagen VI drives serum-starvated fibroblast through S phase and prevents apoptosis via down-regulation of Bax. J Biol Chem 1999;274:34361–8.
. Type VI collagen increases cell survival and prevents anti-β1 integrin-mediated apoptosis. Exp Cell Res 1998;241:230–41.
. Anoikis: a necessary death program for anchorage-dependent cells. Biochem Pharmacol 2008;76:1352–64.
. Fibrin gel improves the survival of transplanted myoblasts. Cell transplant 2012;21:127–37.
. Diminished binding of mutated collagen VI to the extracellular matrix surrounding myocytes. Muscle Nerve 2008;38:1192–5.
. Extracellular matrix development during differentiation into adipocyte with a unique increase in type V and VI collagen. Biol Cell 2002;94:197–203.
. Collagen VI deficiency induces early onset myopathy in the mouse: an animal model for Bethlem myopathy. Hum Mol Genet 1998;7:2135–40.
. Dysfunction of mitochondria and sarcoplasmic reticulum in the pathogenesis of collagen VI muscular dystrophies. Ann NY Acad Sci 2008;1147:303–11.
. The cyclophilin inhibitor Debio025 normalizes mitochondrial function, muscle apoptosis and ultrastructural defects in Col6a−/− myopathic mice. Br J Pharmacol 2009;157:1045–52.
. Genetic ablation of cyclophilin D rescues mitochondrial defects and prevents muscle apoptosis in collagen VI myopathic mice. Hum Mol Genet 2009;18:2024–31.
. Muscle fiber atrophy and regeneration coexist in collagen VI-deficient human muscle: role of calpain-3 and nuclear factor-κB signaling. J Neuropathol Exp Neurol 2012;71:894–906.
. COL6A3 protein deficiency in mice leads to muscle and tendon defects similar to human collagen VI congenital muscular dystrophy. J Biol Chem 2013;288:14320–31.
. Autophagy is defective in collagen VI muscular dystrophies, and its reactivation rescues myofiber degeneration. Nat Med 2010;16:1313–20. Low protein diet in patients with collagen VI related myopathies (LPD). http://clinicaltrials.gov/ct2/show/NCT01438788 (accessed 3 Feb 2014).
. Collagen VI regulates satellite cell self-renewal and muscle regeneration. Nat commun 2013;4:1964.
. Antisense-induced messenger depletion corrects a COL6A2 dominant mutation in Ullrich myopathy. Hum Gene Ther 2012;23:1313–8.
. Allele-specific gene silencing of mutant mRNA restores cellular function in Ullrich congenital muscular dystrophy fibroblasts. Mor Ther Nucleic Acids (In press).
. Inhibition of nonsense-mediated mRNA decay rescues the phenotype in Ullrich's disease. Ann Neurol 2004;55:740–4.
. Specific inhibition of nonsense-mediated mRNA decay components, SMG-1 or Upf1, rescues the phenotype of Ullrich disease fibroblasts. Mol Ther 2006;14:351–60.
. Inhibition of SMG-8, a subunit of SMG-1 kinase, ameliorates nonsense-mediated mRNA decay-exacerbated mutant phenotypes without cytotoxicity. Proc Natl Acad Sci USA 2013;110:15037–42. Contributors TY performed literature search and wrote the manuscript; IN was involved in literature search and preparation of the manuscript.